Thanksgiving has always been one of my favorite holidays. Partially because you get to eat yummy comfort food, partially because it’s the only national holiday where you typically get a free four-day weekend. But mostly because it’s always been a holiday marked by the quiet comforts of home, the warmth of family and enjoyment of favorite familiar things. My family has always been small, so we never traveled on Thanksgiving since everyone lived nearby. Since I moved away, I’ve typically arranged get-togethers with family at other times of year and then reserved Thanksgiving as a holiday to share together at home with my wife — and now with our son too. This was our son Connor’s first real Thanksgiving. Technically he was here for the last one — in fact his due date was on Thanksgiving week that year — but he was only a month old on turkey day, so naturally his mother and I were so beside ourselves that my parents picked up a prearranged dinner for us all from the local grocery store. This year, though, we got back to our traditions and did things up right: a home-roasted turkey with all the usual trimmings, complete with Connor crawling around the house, laughing and playing and brightening our day. 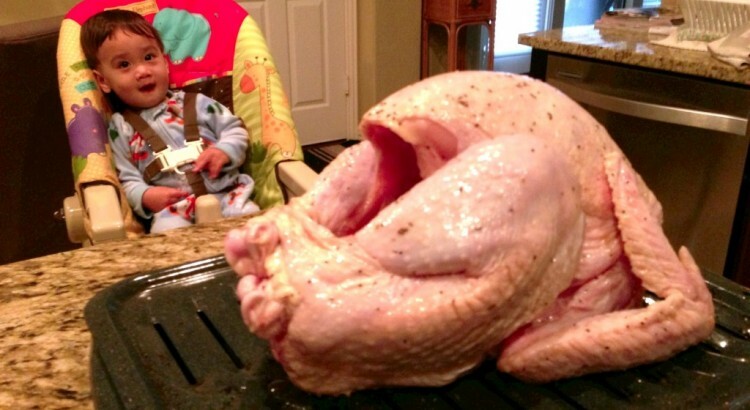 I’m happy to report that it turned out to be the tastiest Thanksgiving turkey we ever roasted. At our old home in Florida we had a convection oven, and while our new place in Texas ups the ante with a full two ovens, neither is convection-equipped. So yeah, admittedly I’ve never roasted a turkey the old-fashioned way. This had me a bit apprehensive this year, but all for naught, as it turned out. We started with the perfect size turkey for our little gathering — a 10.5 pound “Lil’ Butterball” that I shockingly found at an actual Texas grocery store, where I had naturally assumed (like everything else in Texas) that only ginormous turkeys would be on offer. We thawed it in the fridge for 3 days, washed and rubbed it with olive oil and pepper, then roasted it at 325 degrees for about 3 and a half hours. The secret, I think, was basting it with Better Than Bouillon, a paste-based chicken stock that really enriched the flavor. It also bulked up the drippings and made for some excellent gravy later, simply when combined with the gravy packet that Butterball included. I’ve also had a personal tradition on Thanksgiving of getting up early (for me) and playing video games while the turkey was roasting. In days past, this meant rounds of Wolfenstein 3-D or Comanche: Maximum Overkill on my 486. Today it means games of Borderlands 2 and Halo 4 on my Xbox 360. This year, circumstances (read: Connor’s inability to nap well thanks to his having a cold) conspired to prevent me from doing any gaming at the normally appointed time, though I’m pleased to say I managed to wedge in a healthy amount of gaming during my four days off. Speaking of health, it wasn’t an optimal holiday in at least one fashion: we were all sick as dogs at one point or another. I brought back a cold from our trip to Disney World that we took for Connor’s birthday, then Connor caught it, then my wife picked it up. As some kind of final insult, after recovering my health I then got some kind of parting shot infection that gave me serious chills and fatigue for a night, followed by two days of a sore throat. One evening as baby’s bedtime approached, all Mrs. Oddball and I could do was lie on the floor in an exhaustion-and-cold-induced stupor while Connor entertained himself with his toys and books. It was bad. Thankfully everybody is almost back to full operating condition now. I don’t usually gush about family matters (or anything much at all, really) on Facebook as some acquaintances do, but it occurs to me especially this year that I am so very thankful indeed for my family, my home and the life I lead from day to day. My wife and Connor are two of the most beautiful people imaginable, both clearly cut from the same lovely cloth, and for them I could not be more grateful. I’m fortunate not only to have them in my life, but also that we reside in one of the nation’s top 100 places to live, filled with vibrancy and culture and opportunities for our son as he grows. Lastly, as someone who spent most of his schoolgoing years dreading the morning light of every new day, I am thankful that it is now a very rare event indeed on which I ever get up and dread going to work. Instead, I often greatly enjoy the work I do, have lots of fun with my friends on the job and am constantly learning new stuff along the way. There is nothing better. So on this Thanksgiving of 2012, I’m marking a milestone and putting to paper — or the 21st century digital equivalent of it, anyway — the fact that I have a whole lot to be thankful for indeed. Onward now to Christmas and the new year, bringing more family memories to be made, and with any luck, plenty of continued success for us all.